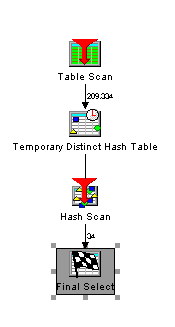 The Db2 optimizer implements the query with a table scan and a temporary hash table. After creation of the index the query optimizer decides to use the EVI and re implement the access plan with an EVI Symbol Table Probe and a temporary hash table. This is much more efficient then the table scan before. 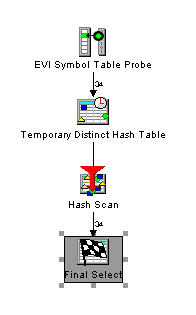 For example while the table scans returns over 200.000 rows for which a Hash table has to be built the EVI Symbol Table Probe returns only 34 rows. The query with the EVI runs on our machine in under 10 ms. This is quite an improvement compared to the 620 ms without an EVI. So if you use grouping in your query you should have a look at the new include aggregates functionality in EVI's in IBM i V7R1.